Valley CrossFit at the Southern California Regional. "Fit Club" by Adam K. Raymond, Hemispheres. Peter and Marie Kuiper, The Netherlands. Post load and total time to comments. "I competed in the 400m hurdles while at Harvard and won the Ivy League Championships twice. After graduating, I was missing training and the competitive edge in my life. 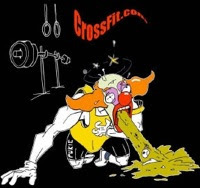 Then my coach introduced me to CrossFit, and I've seen my maxes increase in every category someone can have a max in. Thank you." - Justin Grinstead, Harvard Stadium, Allston, MA. Sorry Everyone, got a bit busy with travel back to Omaha. Cole (age 15) 305-355-385-405-435. Post loads to comments. Josiah Kipperberg, Ocean Shores, Washington. Romina Ibarra, CrossFit Games Latin America Regional. "Are you also exposing your private parts to strangers on Facebook?" by Henry Copeland, Blogads. CrossFit Level 1 Certificate Courses: CrossFit Charlotte, CrossFit King of Prussia, Rogue Fitness, CrossFit Miami Beach, CrossFit Perth. CrossFit Coaches Prep Course: CrossFit Perth. CrossFit Kids Course: CrossFit Vitality. "Much may be done in those little shreds and patches of time which every day produces, and which most men throw away. " Kristan Clever 39:31, Eric Miller 41:43, Rebecca Voigt 44:19, Pam Eamranond 49:45, Katie Hogan 51:29. Fenlon MacDonald, Waterton National Park, Alberta, Canada. "Earth Has Herky Jerky Gravity", Space.com. CrossFit Level 1 Certificate Courses: CrossFit Singapore, CrossFit Champions, CrossFit H.E.L., CrossFit Atlanta. CrossFit Kids Courses: CrossFit Strong. Thruster ladder at the Mid Atlantic Regionals. Flannery O'Connor - A Good Man Is Hard To Find. Watch "Prime Minister Benjamin Netanyahu Addresses Congress". Kristan Clever 12:22 (30lb dbs), Rebecca Voigt 14:50 (30lb dbs), Katie Hogan 19:52 (30lb dbs). Post time to comments. CrossFit Broadbeach at the Australian Surf Boat Rowing championships. "Wolfram Alpha Turns 2: 'People Just Need What We Are Doing'" by Ryan Singel, Wired.